For John and Erin Allwardt that first step involved St. Vincent Catholic Charities’ foster parent information orientation. 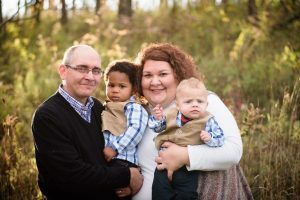 After years of infertility and heartbreak, the Allwardts were contemplating foster care with the goal of adoption. They left their session in 2014 knowing that STVCC was the place for them. 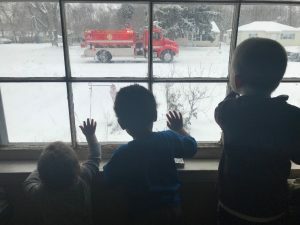 In July of 2015, a ten-month-old baby boy came to them as their first foster child. Ned stayed for only five months, returning to his birth mother on December 11. Reunification is the primary goal of foster care, but it was “devastating” for the Allwardts. Two days before Christmas, John was on his way to do his Christmas shopping and his cell phone rang. STVCC had another placement for them. 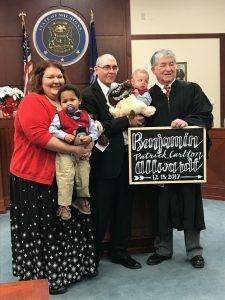 Once reunification was no longer possible, William’s adoption was finalized on October 20, 2017 before Judge George Economy. Earlier that year, Benjamin was placed with the Allwardts from the NICU at Sparrow Health System. He was adopted December 19, also before Judge Economy. “STVCC has paved the way to our greatest life’s work, a family,” Erin said. Recently, Ned returned to their care. Now 3 years old, his future is still a work in progress. For now, he lives with the Allwardts and their two sons. To protect the identities of foster children, pseudonyms are used.